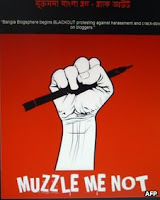 Irtiqa: Standing with Bangladesh's Secular Bloggers! If you haven't noticed yet, there are varieties of ideological battles taking place in much of the Muslim world. Most of these involve the young and educated battling over the future direction of their culture, religion, and their country. The broad contours are often the same, but details vary from place to place. In some instances, it failed completely, whereas in others it achieved various degrees of success. So we had the Lawyers Movement in Pakistan, the Green Movement in Iran, and the Arab Spring in north Africa and a few of the countries in the Middle East. Jamat-e-Islami - ah of the same flavor that is demanding the Islamization of Pakistani curricula as well. Some of the leading spokesperson for this secular movement were bloggers. Well, the religious parties have responded by labeling some of them atheism and blasphemy. This is the new weapon in the hands of the political Islamic parties. Just yell "Insult to Islam" and the mob will take care of the rest. And it seems that atheism - whether real or imagined in the minds of these pious beardy's - has become an "insult to Islam". One of the blogger accused of atheism was stabbed and killed in February. But that wasn't enough. By yelling "insult to Islam", they can distract the focus from the war crimes of 1971. Now these gentle bearded fellows want Bangladesh to follow the example of Pakistan and include a blasphemy law in Bangladesh - yes the same blasphemy law that has led to the destruction of so many innocent families in Pakistan. But kudos to Bangladeshi prime minister, Sheikh Hasina. She ruled it out and defended the constitution as is! Bangladesh’s prime minister has ruled out a new blasphemy law despite a mass campaign by Islamic groups to introduce the death penalty for bloggers whom they accuse of insulting the Prophet Mohammed (pbuh). As part of their push for a change in the law, the Hefajat-e-Islam group on Monday forced the closure of schools and businesses and barricaded inter-city motorways and railways across the country in a general strike. Police said at least 30 people were injured in clashes between pro-government activists and Islamic groups, already infuriated by the recent convictions of leading opposition figures for war crimes. But Sheikh Hasina, who has been leading a secular government in the Muslim-majority country since 2009, said existing laws were adequate to prosecute anyone accused of insulting a religion. “Actually, we don’t have any plan to (bring in a new law). We don’t need it,” Hasina told the BBC in an interview broadcast Monday. “They should know that existing laws are enough,” she added, before stressing that “this country is a secular democracy”. The bloggers, who deny they are atheists, are seeking capital punishment for those found guilty of war crimes during the nation’s 1971 war of independence against Pakistan. They also want a ban on Jamaat-e-Islami, the country’s largest Islamic party, for campaigning against Bangladesh’s independence more than four decades ago. The party is an important partner of the main opposition Bangladesh Nationalist Party, which is led by former Prime Minister Khaleda Zia. Top Jamaat-e-Islami leaders are accused of crimes against humanity during the 1971 war, and two senior party leaders were convicted this year by a special tribunal. Bangladesh says as many as three million people were killed and 200,000 women were raped by Pakistani troops and collaborators during the war. While Hifazat-e-Islam said its rally was nonpolitical and not aligned with the opposition, Ms. Zia’s party backed the demonstration. The group listed 13 demands, including reinstating “absolute trust and faith in the Almighty Allah” in the nation’s Constitution, which is largely secular, and passing a law providing for capital punishment for maligning Allah, Islam and its Prophet Muhammad. At least eight popular Bangladeshi websites used by bloggers have been blacked out in protest over the arrests this week of four online writers. The government has been accused by liberals of appeasing Islamists calling for tough blasphemy laws. Hardliners want those they perceive to be anti-Islamic bloggers to face the death penalty. But liberals say that bloggers' freedom of speech must be preserved. The sites are mostly run by individuals or small teams. 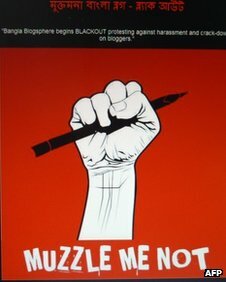 "Bangla Blogosphere begins blackout in protest against harassing and cracking down on bloggers," reads a notice on the home pages of one of the protesting sites inaccessible fro 24 hours from noon (0700 GMT) on Thursday. Detectives on Wednesday arrested blogger Asif Mohiuddin, who was attacked in January following alleged postings on the internet suspected of being derogatory to Islam and the Prophet Muhammad. Mr Mohiuddin was remanded in custody by a court on on Thursday for three days to enable police to question him. His blog is suspended. His arrest came a day after police arrested three other bloggers in Dhaka facing similar allegations. In February blogger Ahmed Rajib Haider was killed outside his home for allegedly insulting Islam. Critics say that the authorities have been bullied into carrying out the arrests following threats from radical Islamist organisations. They have threatened to unleash anarchy if "atheist bloggers are not hanged". This is a political ploy to silence dissent. We have to stand up for freedom of speech and freedom of religion. Most of the bloggers have denied that they are atheists. But even if they were, their lack of belief alone cannot be considered as an "insult to Islam". If you want to see an insult to Islam, then you can find bigots like the Florida pastor who repeatedly wants to burn the Quran or the guy who made the movie Innocence of Muslims. These bloggers have done nothing of the sort (otherwise these beardys would have been paraded that evidence). These issues of freedom of speech and religion, gender equality, and gay rights will repeatedly come up in the Muslim world in this coming decade. There is going to be a backlash from the conservatives. But please go and take a closer look at the 13 points to see how the backlash is going to look like. But I think the tide of history will create Muslims societies that may still be deeply religious but that will honor individual rights (including the right to take hijab and the right to refuse it). But we will have a bumpy road getting there. Couple of things here to consider - Firstly, they are not asking for punishment for all those who were involved in warcrimes in 1971, but only singling out JI specifically. No one is asking for the trial of Mukti Bahini, the bengali terrorist organization in 1971 involved in the massacre of hundreds of thousands of non-bengalis at that time. My grandfather (non-bengali)lost his entire family at the hands of Bengali terrorists in 1971. Secondly, dozens of youngsters linked to JI who were not even born in 1971 were recently murdered in streets of Bangladesh by these secular extremists. It will be heartening to see this drain-hole called Bangladesh to drown in the Bay of Bengal, thanks to Global warmimg and rising sea level. Nature will take its toll and wash away the blood of massacred non-bengalis for whom not a single eye is there to shed a tear on this Earth. Yes, it was a bloody civil war and Mukti Bahini also committed war crimes (it is also quite clear). And it is sad to hear about your grandfather's family. At the same time, lets not gross-over the atrocities committed by Pakistani Army. By most accounts, those were on a much a larger scale. The reason we have to learn about this history and acknowledge it is because this was done in the name of Pakistan - and this may be happening again in Baluchistan as well (it also happened in the 70s under Bhutto). And, yes, I do know (and have written here) about the complexity of Baluchistan as the nexhus of political interests of the US, China, and Iran, and that makes the events hard to interpret in a straight-forward way. But as per clashes, even in the war of independence of 1857, there were atrocities committed against the British. But those were incomparable to the broader atrocities of the British afterwards. And so most of the blame is placed on the British who were in power. But what I'm disturbed by your comment is your broader statement about Bangladesh. You would rather see the death of hundreds of millions of people - men, women, children! This is rather astonishing. I hope that was just a moment of exaggeration and that you do appreciate individual human suffering even if you don't like their nationality or what they did a generation ago. Of course it is exaggeration to the extent of annoyance to underline and highlight the anguish of those whose cries go unheard for the sake of broader interests. Here is a demonstration of how gravity works in the Universe - by M Mehdi Hussain.